Illumination Book Award, silver medal winner. Best Spirituality Books of 2014, from Spirituality & Practice. Mary Lou Kownacki is a Benedictine in Erie, Pennsylvania. Long-time friend and colleague of Sister Joan Chittister, she is the author of A Monk in the Inner City: The ABCs of a Spiritual Journey (Orbis 2008). Mary Hembrow Snyder is a professor in the department of Religious Studies at Mercyhurst University in Erie, PA, where she also directs the Center for Mercy and Catholic Studies. 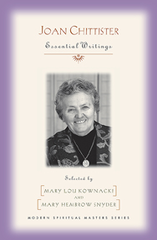 She has edited Spiritual Questions for the Twenty-First Century: Essays in Honor of Joan D. Chittister (Orbis 2001).